Built in 1997 and part of the Bluebridge fleet since June 2015, Strait Feronia has been refurbished since entering New Zealand waters. The vessel has the capacity to carry up to 400 passengers and 150 vehicles on each of its crossings. The interior upgrade sees the ship installed with a movie lounge, quiet area, family room, work stations and a new look café and bar service. Free Wi-Fi is also available to all passengers. Bluebridge provide private cabins whilst travelling across the Cook Strait. The Sleeper Service contains 73 luxurious rooms that deliver a comfortable setting to unwind after a busy day of sightseeing and travelling. They also come with en suite facilities. As well as the private cabins, the ferry has spacious contemporary lounge areas aplenty, spread throughout the public areas. You can also find a designated Quiet Room to relax in and specialised family rooms. If you fancy a bite to eat or something to drink whilst making the crossing, head to the café and Lounge Bar. You’ll be spoilt for choice with premium L’affare coffee, freshly baked breads, tasty cakes and a kiwi-inspired menu carefully prepared by the on board chefs. You can also treat yourself to award winning Marlborough wine as you enjoy your smooth Cook Strait sailing. 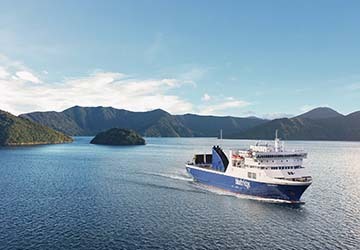 Bluebridge ships also come with complimentary free Wi-Fi, meaning you can surf the web as you surf the waves between New Zealand’s two magnificent islands. A viewing deck is situated on the outside of the ship, meaning you won’t be denied the unbelievable views from Marlborough Sounds and the rest of the Cook Strait. The ship’s Movie Lounge is the perfect way to pass time on your journey. If you’ve had enough of taking in the fantastic scenery out on deck Bluebridge provide free viewings of the latest movie releases. Bicycle storage is provided beneath the decks for those arriving to the port on two wheels. Lashings are provided to help secure the bike to rails and brackets, with rags given for padding. If you’re travelling with the little ones there are plenty of facilities to help ensure a stress free sailing. There are baby changing areas at your disposal and a family room to base yourself in. Every movie shown in the Movie Room is rated PG, meaning that there is something for everyone, including younger voyagers. Please Note: Whilst we have taken great care in making our Strait Feronia guide as accurate as possible, onboard facilities, services and entertainment may vary depending on the date and time of year that you travel, facilities mentioned may change without notification and ferry companies reserve the right to operate vessels other than those mentioned at time of booking without prior notification.